RogueKiller is, as its name suggests, a program entirely dedicated to finding and removing rogues that intrude on your computer. Rogues are malware that install themselves on your machine, most often pretending to be a third party program and attempt to collect your information. Especially tough, they require specialized software to get rid of them. 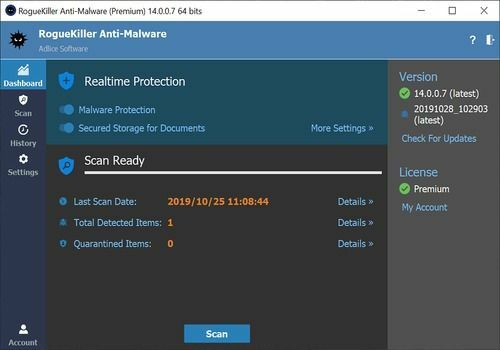 This is the case with RogueKiller, which relies on its ability to detect them quickly and remove them effectively. The software offers a simplified interface that allows you to launch a scan in a few clicks. You then obtain a detailed report with the detected threats so that you can then delete them. RogueKiller has a regularly updated database and is free software. If you like, the author of this program will gladly accept a donation via PayPal. The complete solution to protect your important data: backup your PC, files, system and applications!